How would you guys rank which teams had the better draft? Best 1st and worst last. Packers -------- HaHa helps shore up their secondary and 3 more targets for Rogers. Only GOD can help our secondary. Bears ------ They shored up their D-line and DB's. Their secondary is no longer a sieve. Ours is. Vikings ---- They improved across the board. And now they have a QB that won't wow you. But, he won't make many mistakes either. Lions -----I'm coming around on Ebron, I love the Van Noy pick and like the Swanson pick. But, if this draft is an indicator of Xanders draft system, let's just say, I'm un-impressed. Can't pick between Packers and Bears as #1. It's too early, but I still love both drafts. If I have to rank them, I'd have CHI first, us, then MIN. Here in Chicago they're calling their draft very "safe." I think the 2nd round DT was a reach, their 3rd round DT was good two years ago but not so much last year, and the RB they took is very uninspiring. Fuller was a good pick up, but they're already talking about playing him out of position (safety), which seems like an odd move for your 1st rounder. Besides Briggs, their LBs are terrible, and as milliam21 noted, so are their safeties. Although they brought in some good players on the D-line, it just doesn't seem like they have a clear vision of what they want to do on defense. Emery is a big fan of athletic prospects with high upside, but it's my impression he doesn't give enough thought to how the draftees will actually fit with what they do. I always thought the Vikings would be scary if they had an actual good QB. Problem is, I still don't think they have that. GB is always a threat with Rodgers, of course, but their line needs improvement. Still not sold on their defense either. They've always been opportunistic, but I don't think they can hold up against a dominating offense. I will be impressed if we hit on one or two UDFA again like we did last year! 1.10 Eric Ebron, TE, North Carolina - Solid pick IMO, adds a weapon to our O, probably was a better selection than Mike Evans if he would have been there. There were no defensive players that would have made a bigger impact on D, than he will to offense. 2.08 Kyle Van Noy, OLB, BYU - My favorite pick this year. Been wanting an upgrade to SSLB. 3.12 Travis Swanson, C, Arkansas - Felt this pick was a reach, but if Washburn likes him, that's good enough for me. 4.33 Nevin Lawson, CB , Utah St. - Small but feisty corner, nickel/special teams ace. 4.36 Larry Webster, DE, Bloomsburg - Project w/great potential, thought he would go later. 5.Caraun Reid, DT, Princeton - Great pick, thought he would go higher. 6.13 TJ Jones, WR , Notre Dame - Very pleased, great hands, solid slot potential. 7.14 Nate Freese, K , Boston College - He's a kicker, I don't see the need to draft a kicker. Sign one after the draft. Tons of them that go un-drafted, so why waste a pick. Don't know about you, but to me Mayhew threw BPA philosophy out the window in this years draft. He was targeting on alot of these guys. Not that it's a bad thing (drafting for needs) just saying. I know a lot of people are saying Swanson was a reach, but I saw him mocked to us in quite a few drafts in the 3rd, so I can't say I'm surprised. "We'll take the best player available for us, and that's what we've done here in the past and we'll continue to follow that formula," Mayhew said Monday during a news conference at the team's Allen Park headquarters. "We're not going to reach for need. "When I say reach for need, I mean, if you've got three or four guys that are similarly graded that you can take, that will come and play for you and contribute something, I don't think you reach down nine spots to take somebody because they play a particular position. That's what I'm saying." "It's not necessarily their numerical grade is one tick above the next numerical grade, so you take that guy, even though he's not going to be able to be on the field for you..."
So you see, he doesn't say best player available in a vacuum. It's best player available for us. If memory serves, he has also said in the past that team needs play a part in how they rank players. So it's not like they rank players based solely on ability with no regard for the team's needs. For example, if the best player (overall) was a QB when the Lions first round pick came up, do you honestly believe they would have taken a QB? Of course they wouldn't have. Similarly, Ebron may not have been the absolutely top ranked player when the Lions pick came up, but based on the Lions team needs, structure, etc., they had him and the highest rated player for them. I know I'm probably being a bit of a pain about this, but I keep seeing people posting about BPA as if it's occurring in a vacuum with no regard to team needs, and that's simply not the case. This all seems very accurate. I would also say it's very possible that they could have 8-10 guys at any given time ranked at the same value, so if a guy gets picked up 10 or 15 spots higher than the experts have them rated its not actually a reach because all those players are considered equal talent by actual teams and scouts. I think the 1st round and maybe the 2nd are the only rounds teams have a really solid ranking system. Outside of those rounds its just a general idea of who is a better prospect than the next guy. Mayhew has said that many times, that he'll take the top player available on the Lions board, and that board is designed with positional needs in mind, along with talent levels. 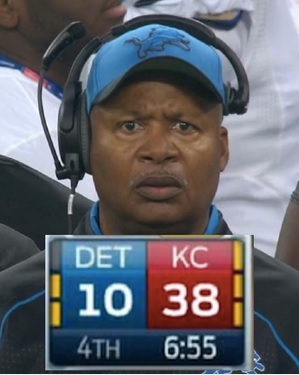 That said, how has that plan worked out for the Lions thus far? In the same time frame that Mayhew has been running the Lions, the 49ers and Seahawks have gone from basic doormats to NFL powerhouses. The Cardinals improved dramatically. And a number of other teams have gone from being mediocre to vastly improved. What's the definition of insanity? Doing the same thing over and over, expecting different results. It almost seems as if last years draft was the 'even a blind squirrel finds a nut now and again' theory. I think that Mayhew and/or the Lions scouting staff are either poor evaluators of talent, or simply over-value the talent and ignore other things. If you don't think that, explain Titus Young, Ryan Broyles, Jahvid Best, Amari Spievey, Derrick Williams, etc. These are all relatively high picks who have been complete busts. I understand you can't hit on every pick, but how the hell do you miss on just about every second and third round pick over the course of that many drafts? Look at the successful teams in the NFL, and they do a MUCH better job in those rounds than the Lions have. That said, the Packers had the best draft of the NFC North teams to me. The Bears come in second. The Bears took good players that fit their needs. Sometimes that's what you have to do, particularly if those needs are critical. With the way things are set up in the NFL, you don't sign free agents to fill ALL your needs. If that were the case, free agency would start after the draft. The Lions didn't fill all their needs in free agency (Tate isn't our WR answer, and Cassius Vaughn isn't our CB answer, and I don't think we signed a linebacker of note). The draft is where you should look for talent, but also try to fill those needs. And before someone goes on a rant, I realize the Lions can still sign free agents. Are those free agents going to be any good? They are players passed over by 31 other teams, or who are recent cast-offs. You don't find gems falling out of other peoples pockets. It is RARE to get a player like Joique Bell, passed over by other teams but who has quality NFL talent. Rare. The Bears took good players that fit their needs. Sometimes that's what you have to do, particularly if those needs are critical. With the way things are set up in the NFL, you don't sign free agents to fill ALL your needs. If that were the case, free agency would start after the draft. the bears biggest need was safety, and they did literally nothing to address it. I get they drafted peanuts heir apparent and got a lot better on the d line, but no respectable defense would keep conte on the roster after the season he had, let alone start him. IMO the bears draft was the worst. The packer also took 4 pass catchers and neglecting a poor offensive line. However I'd be willing to give Thompson the benefit of the doubt in the draft, which i wouldn't do for any other in the division. What did the 49ers and Seahawks also do at the same time they went from doormats to contenders? They changed coaching staffs. Harbaugh took over the same team that Nolan and Singletary had, so you can't really compare how they drafted as to how they changed mentalities. Many here though Carrol would be a bust out in Seattle, ignoring that he had the Jets and Patriots with winning records in very short time before being replaced, in NE by BB. Sometimes it's as simple as the players not being used right or coached properly. I do agree that they've had their share of misses. Best was used as an example by the league for concussions, while Spievey I believe just was a failed transition from corner to safety. I hate having players switch positions, especially if you're picking them that early. I think Xander's influence in processing the info from scouts to front office is where the improvement was last year. Under Millen it was ignored completely. And honestly, I can really make judgements on the draft or how our current personnel will rank up because of the new coaching staff. With a new offense and defense, players that weren't any good in the last could magically be coached up to perform. It's not a guarantee, but too often the last few years we saw the same mistakes being made by all the players. Those types of things happen by bad coaching, it's not like an airborne virus. The Lions have revamped their entire scouting system and replaced their medical staff. I'd say that qualifies as doing things differently. The 49ers had a good roster to start with and just needed a better coach, they have had pretty standard drafts since then they just have the luxury of letting guys sit. The Cardinals also were improved due to better coaching on the defense, a lot of their key players were there before and since their improvement they have maintained the talent level with the draft. Seahawks are the only real example of a team that just changed over night with like 2 good drafts in a row. This year should tell us if the Lions have corrected their past mistakes or if last year was just a fluke. If things go sour this year like in previous years then we get to see them move to a new GM and Coach. Your statement, " It almost seems as if last years draft was the 'even a blind squirrel finds a nut now and again' theory. I think that Mayhew and/or the Lions scouting staff are either poor evaluators of talent, or simply over-value the talent and ignore other things. " hits the nail on the head. I've felt that way for some time now, and have said so previously. Not saying he's a bad GM. I think he's done a solid job of restoring the Lions to respectable. But, his draft record speaks for itself. Last years draft was impressive. We'll see if this years draft can be the same. I think Bill Jr. is a smart guy, and won't let the Lions stagnate. If the team fails to improve through intelligent drafting, believe he won't hesitate to make a change now that it's his call.